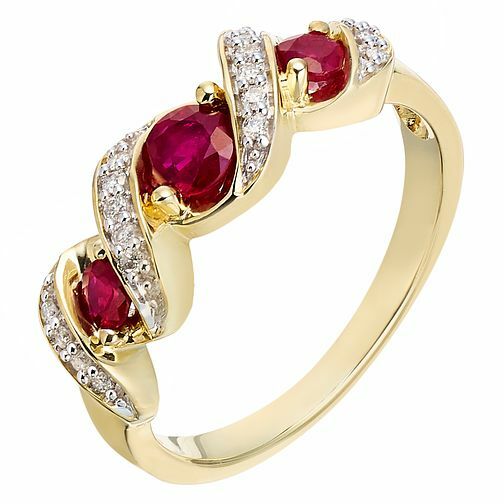 9ct Yellow Gold Treated Ruby and Diamond Ring is rated 4.8 out of 5 by 4. Rated 5 out of 5 by Anonymous from Beautiful design I bought this ring for my wife's birthday, it's a beautiful looking ring, elegant and the contrast of the stones along side each other really sets it off. Rated 5 out of 5 by Anonymous from Ruby eternity ring I love this ring which my hubby bought me for our ruby anniversary. It sparkles and shines and it's just what I was looking for. Paul and Kath were so helpful. Wish all shop staff were as nice and friendly.